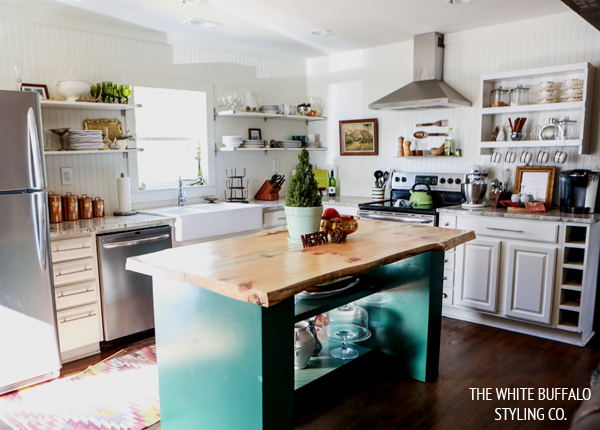 5 days, 53 bloggers, 53 amazing homes. I am so honored to be kicking off this series and have such talented ladies on board. 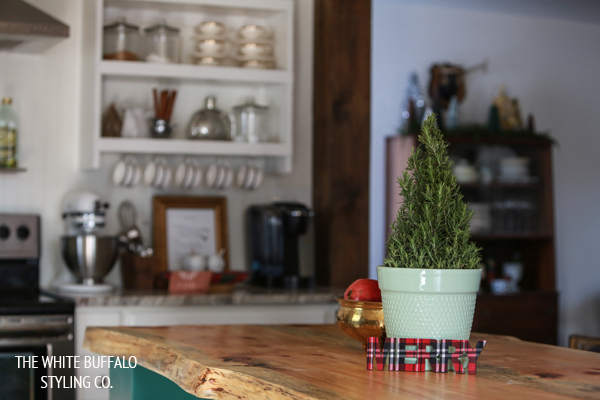 Sit back with a cup of your favorite Christmassy brew and get ready for some serious inspiration and Christmas cheer. For my tour, I was going for a very certain style: Anthro Christmas Lodge. Remember my inspiration? And that is exactly what I went for with style. Not to follow rules or limit myself, but because that is a style I truly love. There were six things I really sought to bring in to carry out this style. 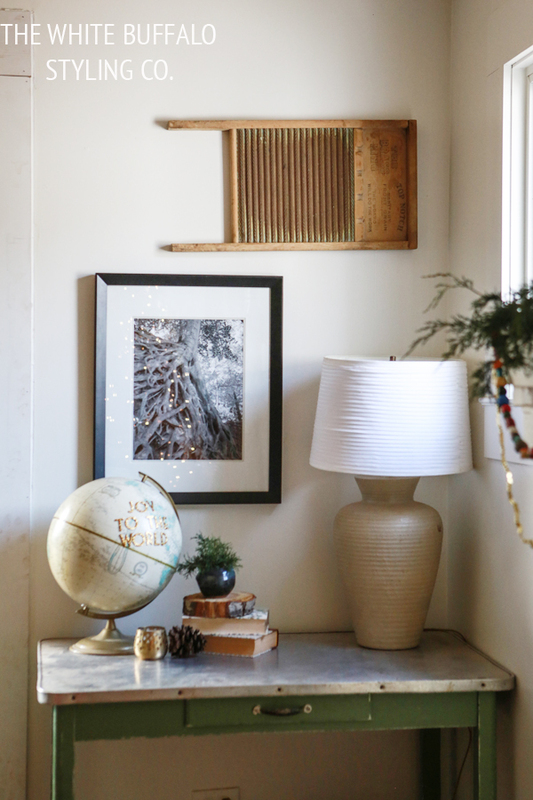 Yes, this post should’ve come with a warning: THIS DECOR NOT FOR THE FAINT OF HEART. 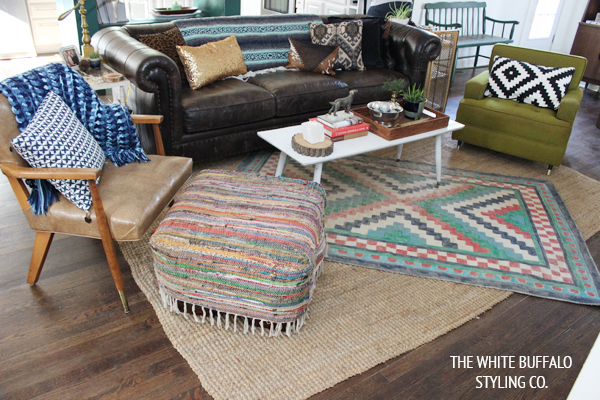 Eclectic is my thing, after all. I promise, it worked out. At least…I think so. But I am warning you up front…this is VERY picture-heavy. I’m bad about narrowing down…so, if you need to take a little cookie and coffee break in the middle, don’t worry. I don’t judge. Right inside the door, you see our mantel and lounge area. I used colored candles for a little pop. 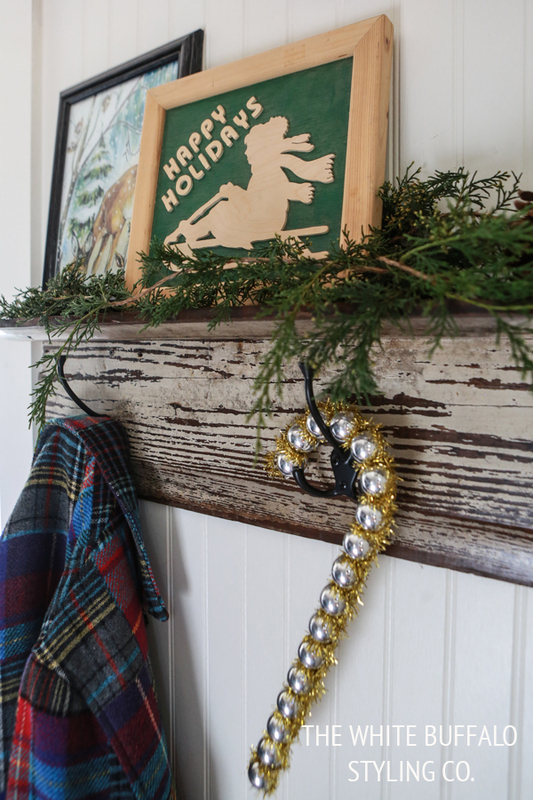 I also made a wood bead garland, added a little gold for some glitz, updated our burlap stockings with some personality, and gave Mr. Antler a little disco. Our tree even got a disco ball topper. This was a 12″ disco ball ornament from Hobby Lobby that my husband rigged up as a tree topper. 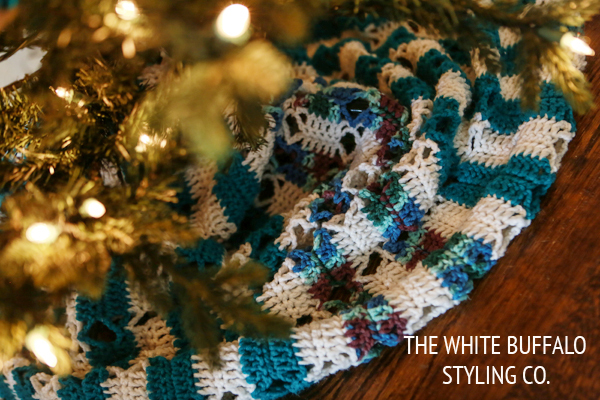 …and used a colorful, woven blanket as the tree skirt. My desk turned into one of my very favorite spots. And the last thing in this front room is our entry table. I’m loving my Joy to the World globe. The living room got a little fancied up for the season. 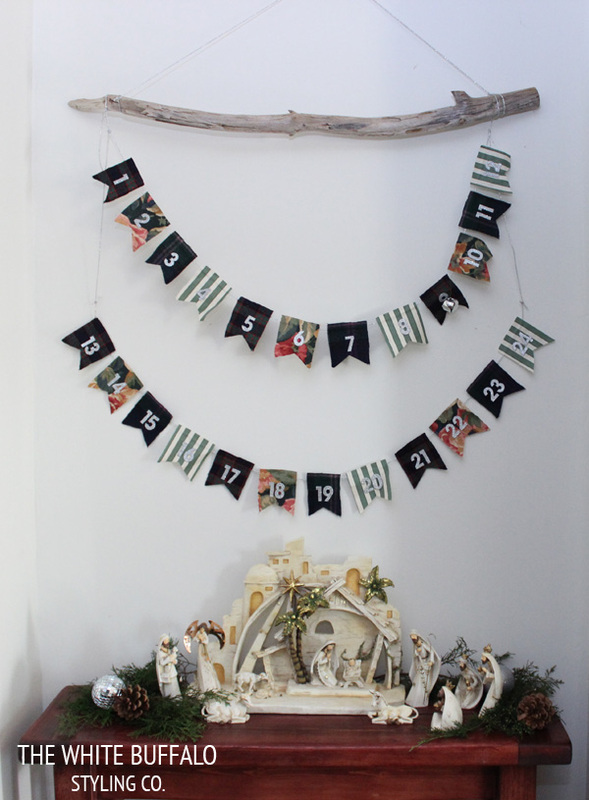 Our DIY Advent calendar and nativity is another favorite. 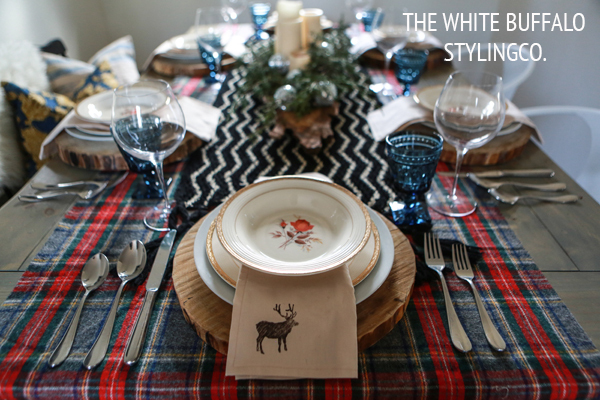 And what would a Christmas tour be without a little Christmas tablescape action? I layered a shaw made by my great-grandmother on top of some plaid. The dishes and glasses are vintage. The napkins are from the shop we had last year and I love them! 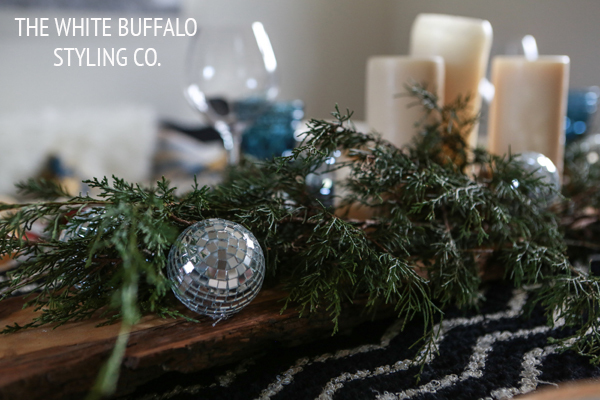 And a simple centerpiece of candles, greenery, and of course, disco balls seemed to fit. 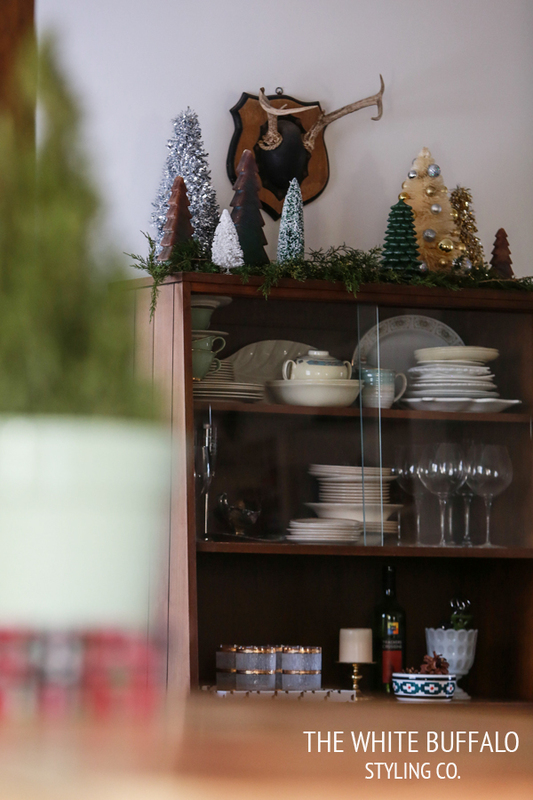 And one of my favorite things in the house is the little Christmas tree forest on top of the dining room hutch. 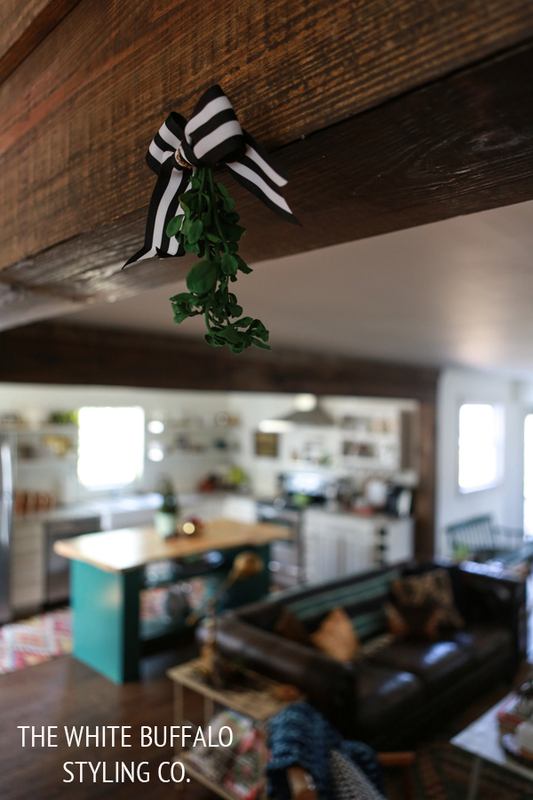 The kitchen needed a little Christmas love too, naturally. 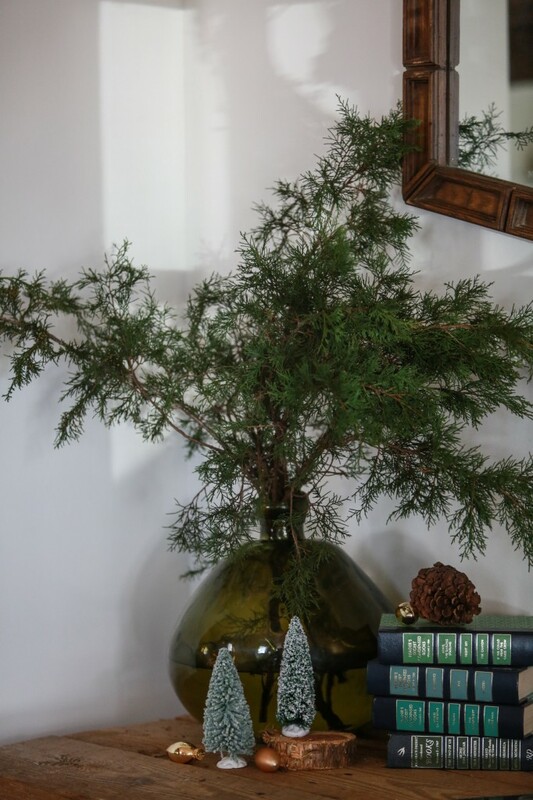 I’m loving this fresh rosemary tree on our island. 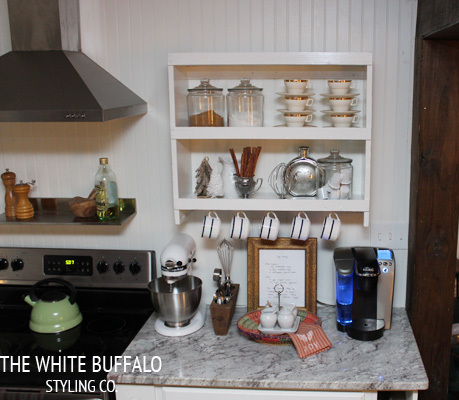 And we are SERIOUSLY enjoying our new coffee and baking station. 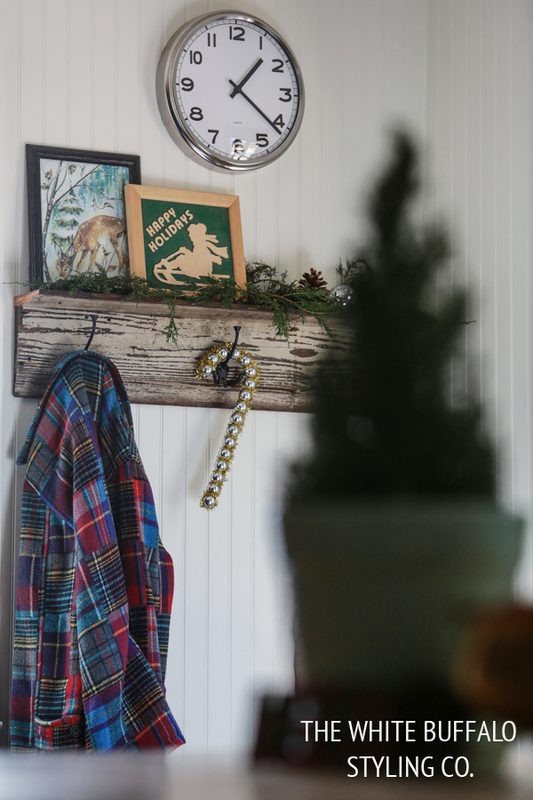 And we’re almost done…hang in there….here is our new mudroom gussied up for Christmas and it’s demanding to be the finale of this here tour. I know I haven’t shared the details on this one yet, but I will later this week. I’m really in love with the Christmas art. The “Happy Holidays” is from a thrift store and the other is a print I framed. Whew. I know. You’ve refilled your coffee cup three times and the third one is now cold. But thank you for coming to tour our Christmas home. Now, onto the rest of today’s goodness. 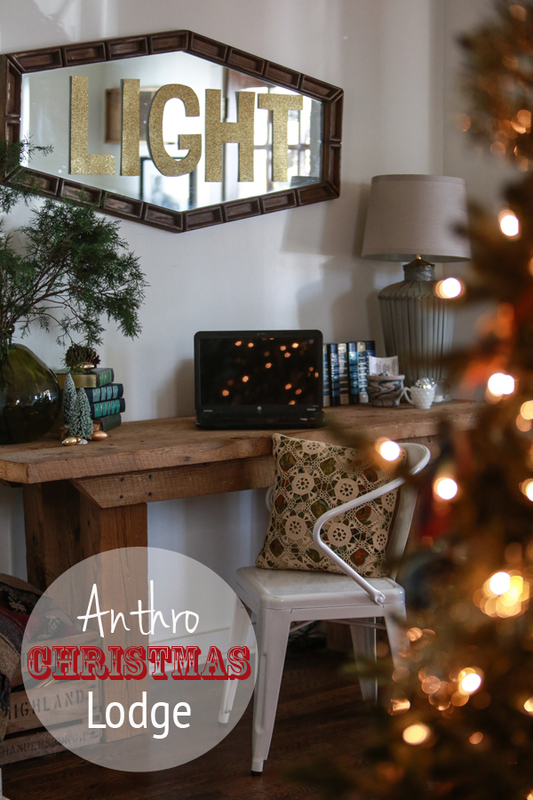 Make sure you stop by these lovely ladies today for more of our Christmas blog hop. 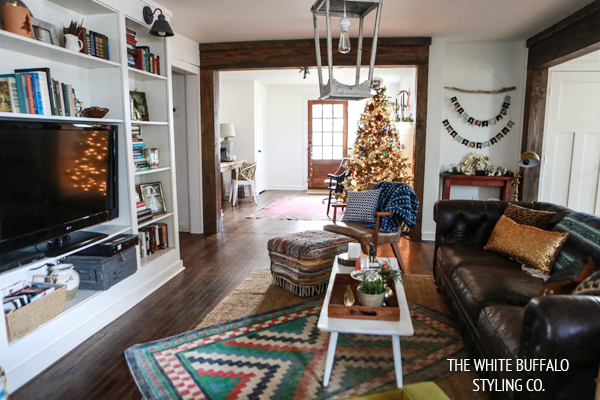 I’ll be back sharing my faves from their home tours later today! 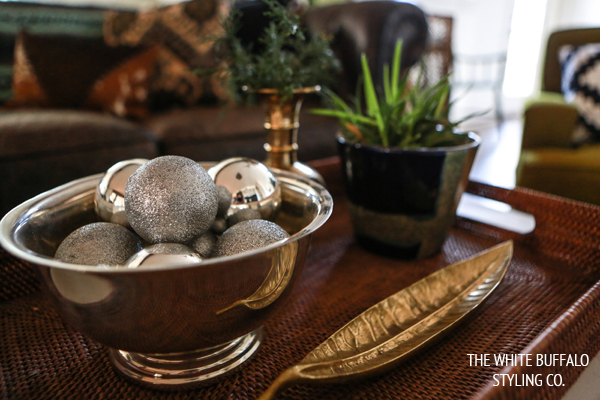 LOVE the look of your holiday decorations…especially that globe!! Thanks for some great inspiration! 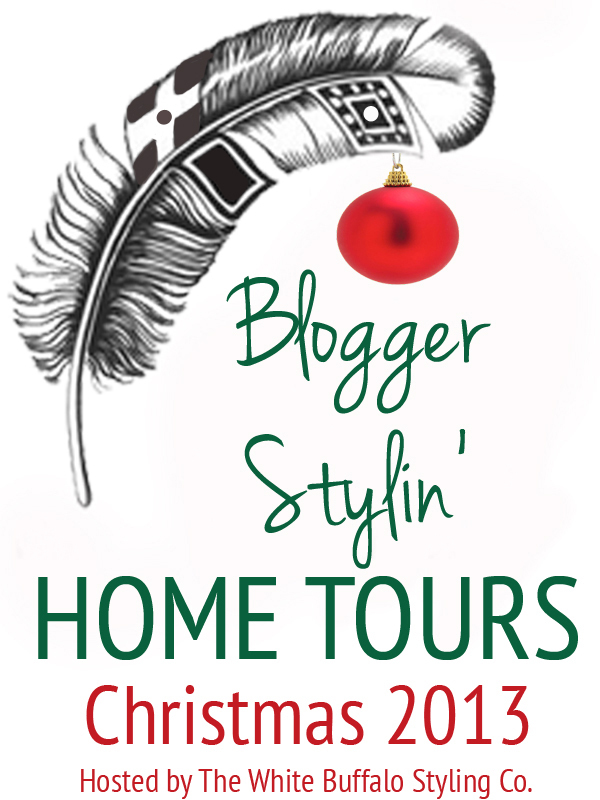 I’ve seen a lot of homes on Christmas Tours….. you get the double A+ star ladyjane…… it was wonderful, different, stylish, unique and happy. Thanks so much for sharing! You are so darn stylish lady! Love it! Your tour is so unique and definitely Anthro! 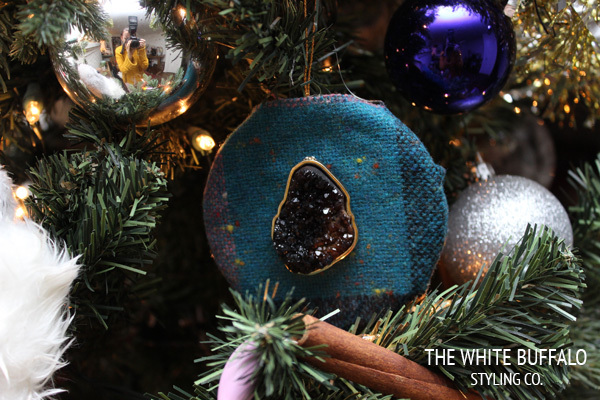 Love your tree and your gorgeous homemade ornaments. And of course that topper is so me! fantastic, girl. cozy and beautiful; I love all of the little details!! Thank you so much, Jennifer 🙂 The little details make me happy too. Lindsay…you nailed it! So unique, so you, so beautiful! Love it girl! Your place looks so cozy! Your tree is beautiful! Everything looks fantastic, Lindsay! 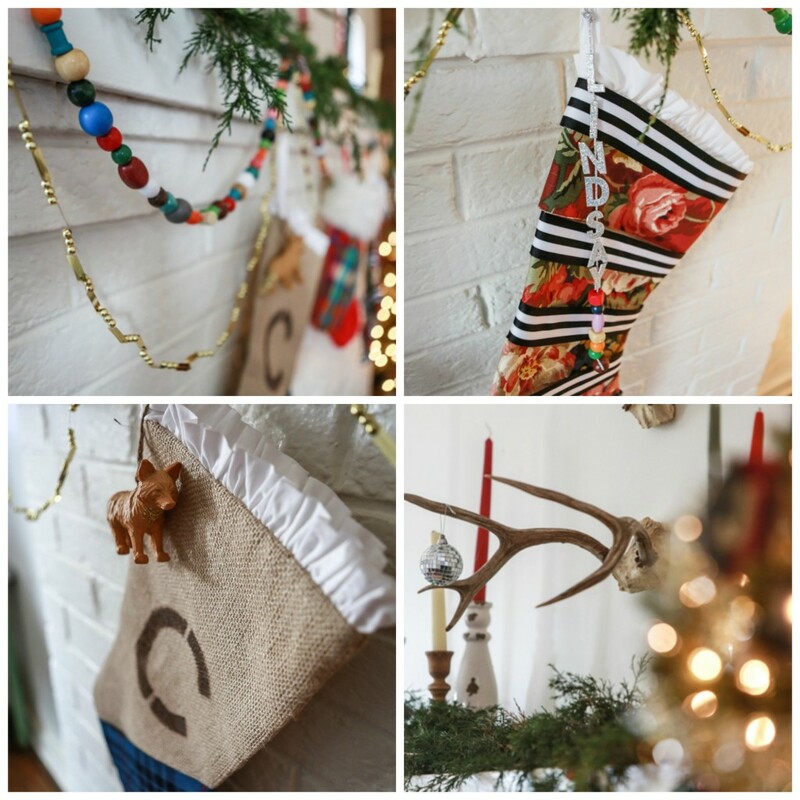 I especially love your mantel….just perfect! Love it!! Everything is perfect! no corner left untouched, and they are all gorgeous. 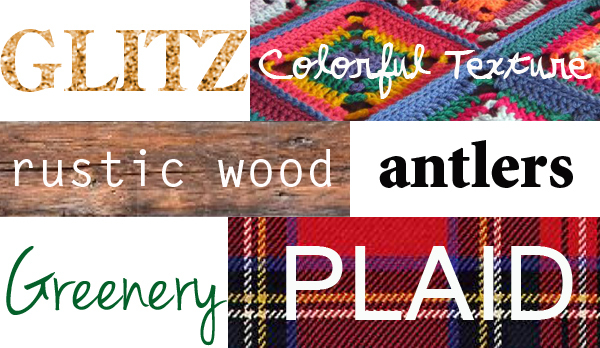 i particularly love your table, and all the gorgeous plaid layers. i love that you chose a theme and went all out! Love it as always! I am with the others on the details! Mad skills 🙂 Love your desk area too!! LOVE IT ALL. your home blows me away! 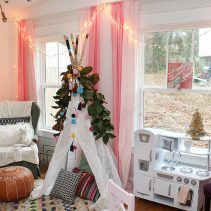 i love the tree and its skirt (i did a blanket skirt, too)…. love the topper! 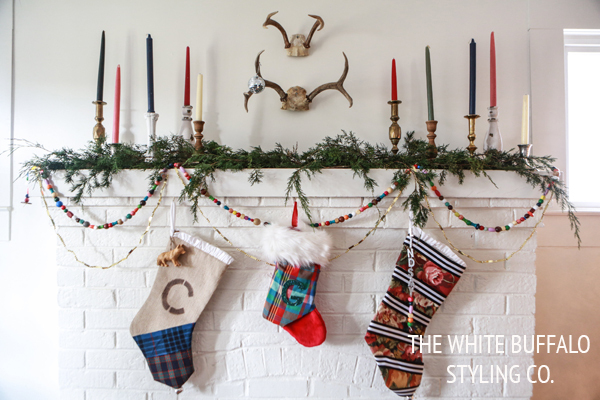 and your mantle- perfection! seriously i want to come over and hang out in your cozy home! Great tour, Lindsay! You definitely made all those elements work together! 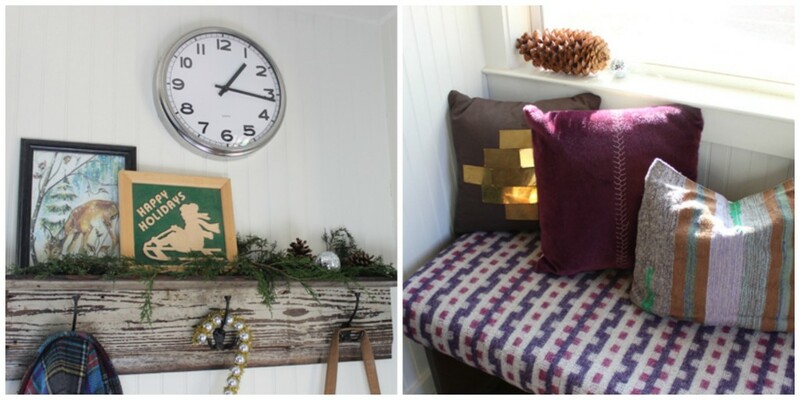 your home is beautiful before the holiday decor…now it’s a whole new level! thank you for all the inspiration! I LOVE this tour! Great job, Lindsay! Everything looks amazing! 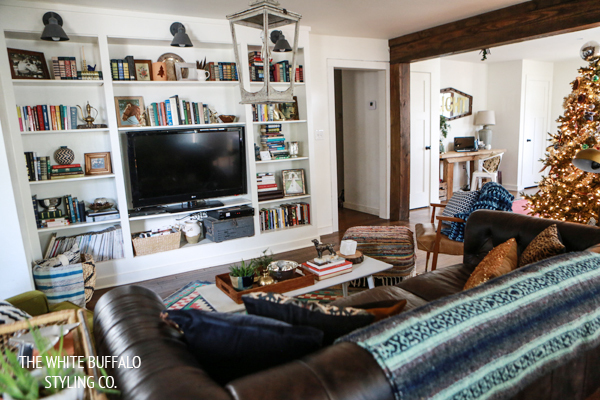 Beautiful job, Lindsay – so warm and cozy! Everything looks so so fabulous!!! 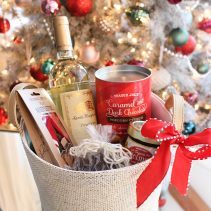 I love that it’s non-traditional Christmas colors and items. 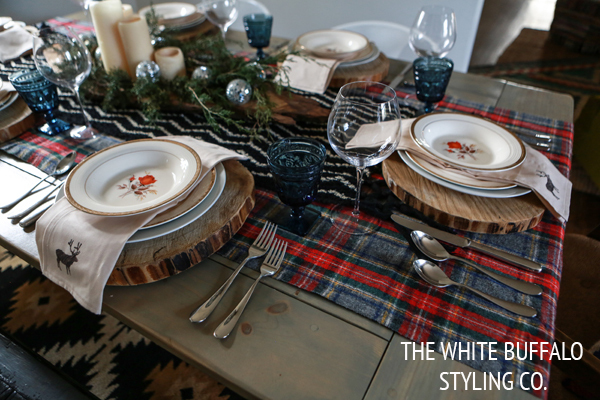 The globe is so cute and those wood slice charger with the flannel runner- perfection!!! As usual, it’s amazing. Love the mix of everything and the small touches throughout. Love it!! 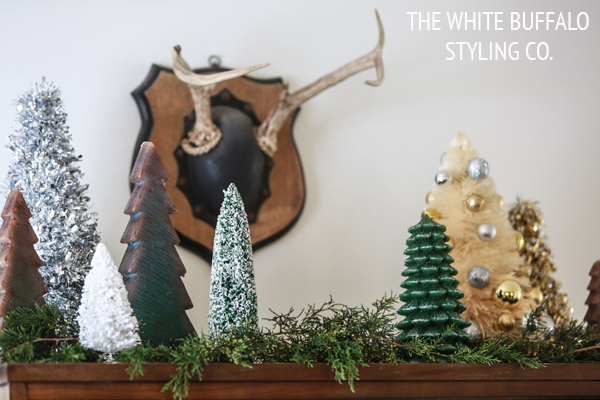 I love series like this it’s really cool to see everyone’s style interpreted with Christmas decor! Yours is so you!!! Beautiful! 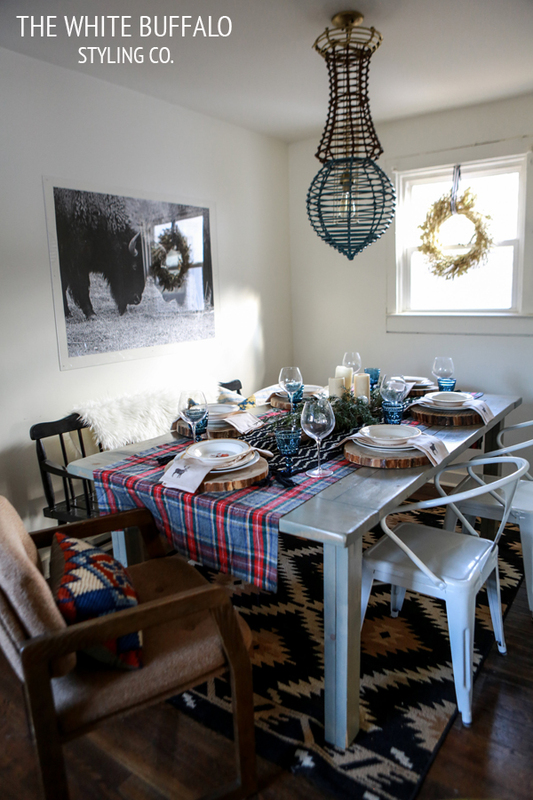 What a lovely space you have created for the Holiday season!!! 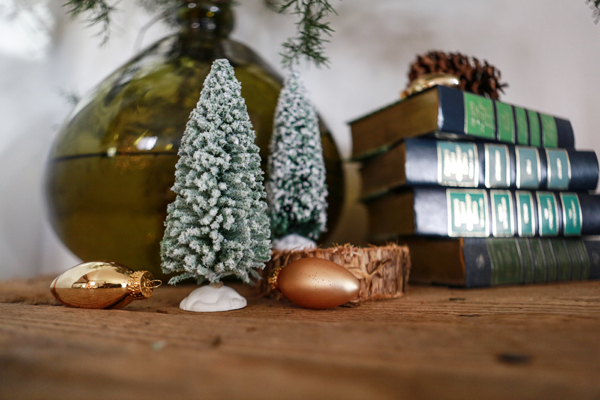 I love those little tress on your hutch and the beautiful nativity! I totally see your Anthro inspiration! You nailed it!! Hi Lindsey!! I LOVE LOVE LOVE all the little trees, the globe, and the LIGHT mirror 🙂 And I absolutely love this tour <3 Thanks for sharing! SO much eye candy! I love your little globe! And the tree topper! Beautiful, beautiful, beautiful! You had me at disco ball Lindsay! 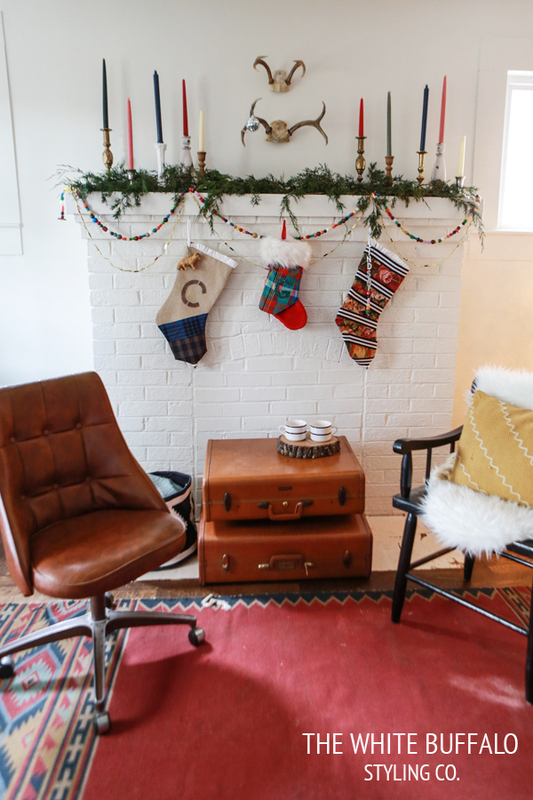 What a fun and eclectic and festive home! 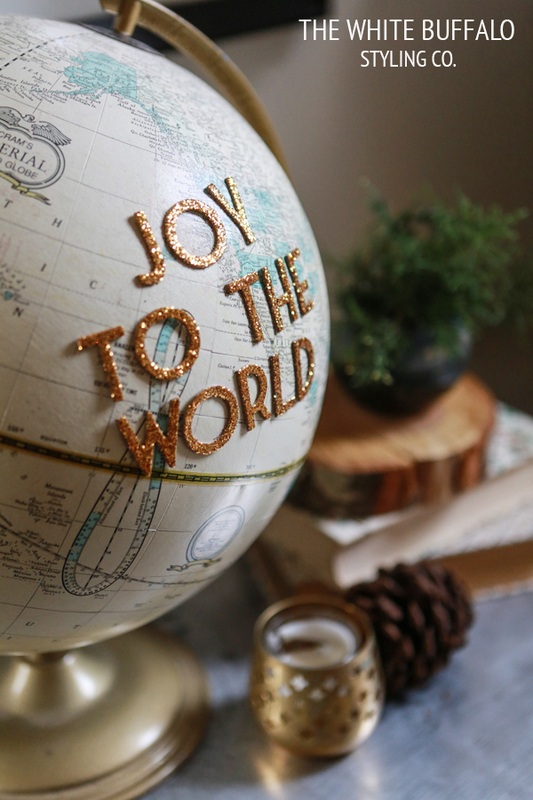 Love your joy to the world globe and all you vintage touches! You rock – and now I’m in the mood for some disco music! I’m a big fan of Anthropologie. 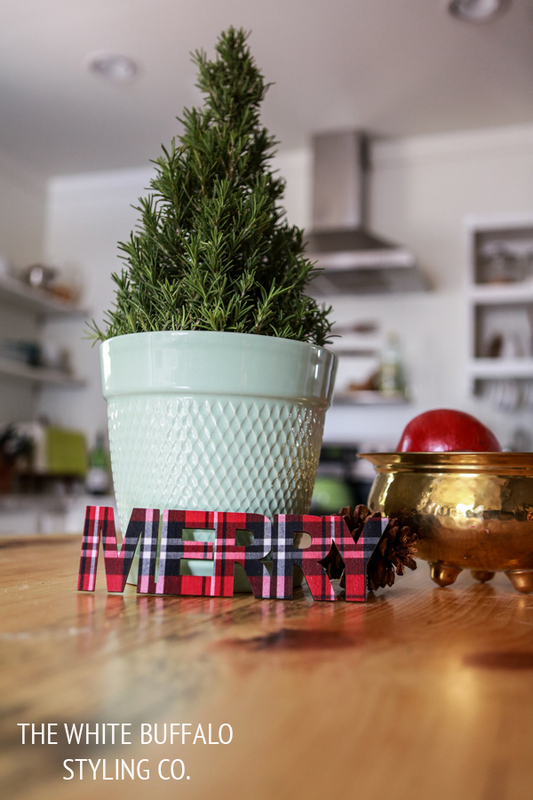 Loving your bold take on your beautiful Christmas decor. So warm, cozy and pretty. Found you on FB. Glad I did. Merry Christmas. 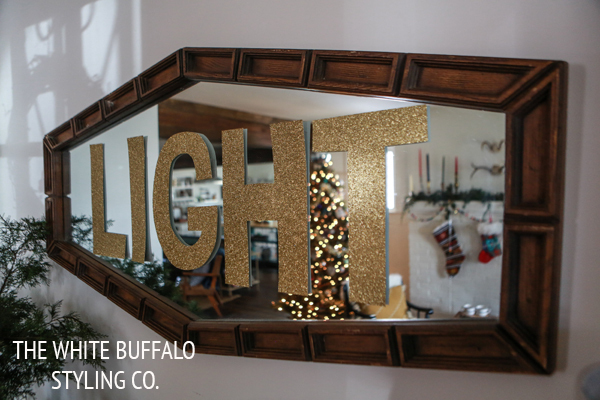 Your home is beautifully done for Christmas! 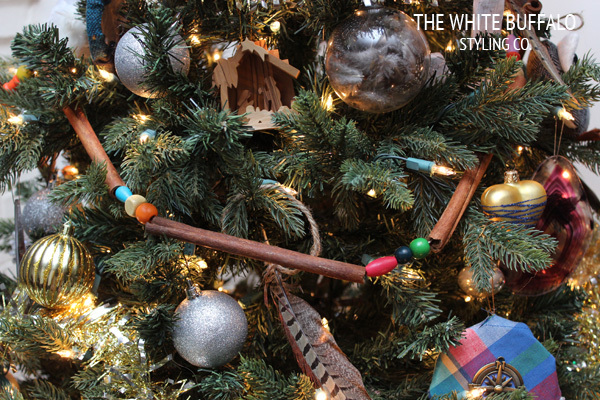 I love the tree slice chargers on your table! Did you make them yourself? I may have to get my husband to get out his saw! Christmas blessings to you! 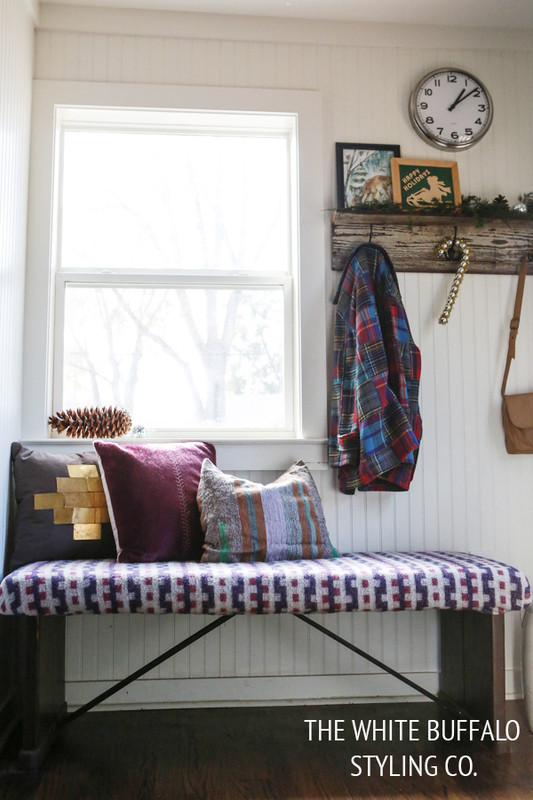 So cozy, fun, and stylish! I just want to snuggle up and enjoy the sparkle! Wow Lindsay! You knocked it out of the park! I love your tour, and I’ll definitely be stealing your Joy to the World globe idea…I have a plain old globe just waiting! Great job friend! You do such an amazing job of breaking down an individual style and then rebuilding it with what you have and custom pieces! I wish I could spend the rest of the holiday season in your house! Is that weird? You nailed it, it looks beautiful! Lovely, lovely, lovely! Shouts ANTHRO! Funny! Just saw your house on YHL, then someone told me I would love your style and here I am, twice in one morning. Gorgeous. 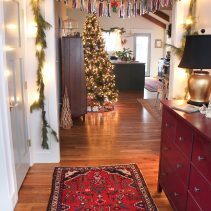 I love everything…please give me some of your rug luck because right now we just have wood floors- which is WAY better then the dusty rose 20 year old nasty carpet we just tore out!! Love your tour, I’m enjoying my tea during it 😉 I was loving all those disco balls and the cinnamon garland on the tree, so cute and I bet it smells nice! So I have to ask, where did you get the little gold lettering? Did you make it? I LOVE your style! I just stumbled across your blog and so glad I did. I love seeing homes with so much individual character and not just the latest trends. 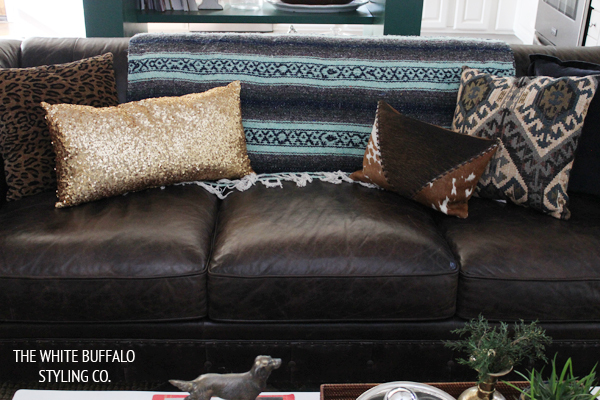 Your home looks comfy and full of personality. 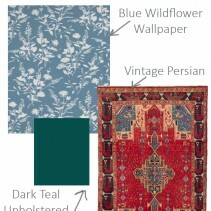 Your mix of textiles is gorgeous and I hope to have your luck for scoring thrifted rugs, love them all! 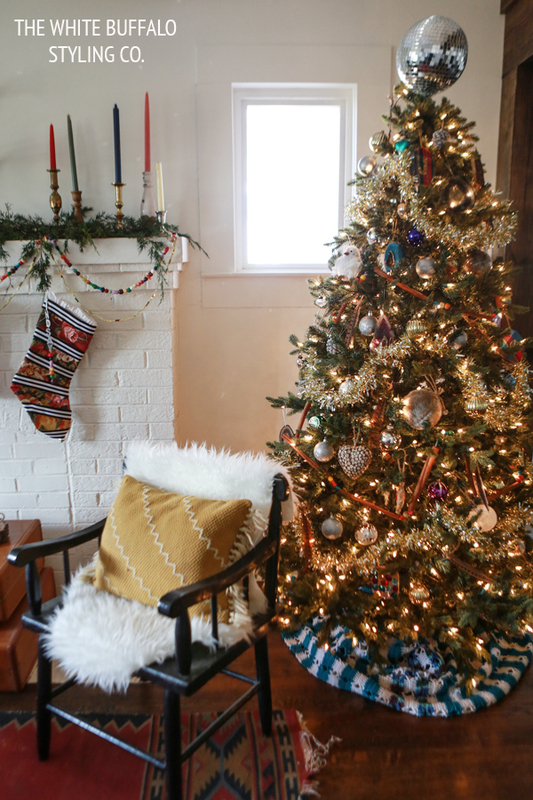 Definitely one of my favorite house tours of the season! I just love the whole vibe of your house. Perfect!